Shay Harris—Before going to college I had this beautiful fantasy of what it would all look like. I envisioned purple grass, gold skies, and late nights tearing up the streets in a vehicle that would make Marvel’s Ghost Rider jealous. Now, all of that’s a lie, but I did have expectations—many of which were subverted. I thought that all of the friends I made during freshman year would follow me ‘till the end. I’m in my senior year and while some of us are still close, that “core group” isn’t what it used to be. I expected to be a regular at the gym to develop what I had been taught an “ideal” male body is. The Hershey’s on my desk will say otherwise. For a moment I even expected to transfer schools after my first year, but I’m still here and uber grateful for staying because I’m grateful for all my time at Brockport has helped teach me thus far. I see these subversions as good things because they’ve challenged me to think differently about myself and the world. Now, this leads me to the best advice I’ve received while in college: to love myself. Now, this may be a cheat, but this advice did not come from my mom, Nana, professors, or friends. 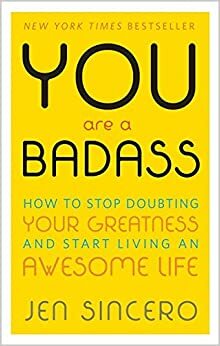 I came across this nugget of advise from “You Are A Badass: How to Stop Doubting Your Greatness and Start Living an Awesome Life,” a book by Jen Sincere. I found this book in a donation box at the end of my sophomore year of college. That semester marked the end of my first year as a Resident Assistant (amazing experience) and the summer of 2016 would be my first as an Orientation Leader. I was excited, but nervous because I had some baggage to sift through. I opened this post talking about expectations because a large one that I have struggled with is the expectations I place on myself. For much of my time in college I was brutal to myself regarding how I looked and sounded, my hobbies, and lack of a romantic life (this was a HUGE one). I would constantly compare my deficiencies to what I perceived as the “successes” of others and felt crappy every single time. “I wish I was in a relationship,” “I wish I could bench my bodyweight,” “I wish my family owned a boat.” etc. You get the point. I wanted a lot of things. However, Sincero’s novel opened my eyes to a a fact I refused to accept, a reality I struggled to see: I’m AMAZING! Learning to love myself was not something I mastered overnight. In fact, I’m still learning new ways to treat myself better. You may be wondering, So what does loving yourself look like Shay? To you I’d say it depends on the person. To me, loving myself involves a plethora of things: making my bed every morning, adopting a minimalist lifestyle, playing with Legos, and talking to myself on a daily basis about what I’m grateful for are just a few ways I practice this thing. This advice that I got from a book I found in a dingy brown box played an integral role in my coming out process. The summer of 2016 was the greatest of my life at the time because I finally came to terms with my orientation, ridding me of a shoulder crushing weight, and allowing me to be truthful to my friends, family, and most importantly myself! I implore people to practice loving themselves because life is too short to do otherwise. Self-love keeps me grounded when my courage and confidence are shaken. It helps me move forward when I all I want to do is roll into a ball and give up. Self-love reminds me that no matter the storm, a rainbow is certain to follow. My mom likes to say, “You’re doing better than you’re feeling,” another quote worthy of writing a post on. Self-love pairs wonderfully with that because well…it just does. Loving myself, like, truly having transcending moments with my mind, body, and spirit transformed me into a better person. As an Orientation Leader, I saw the benefits of self-love because I knew that living my truths and accepting myself—flaws and all—would inspire incoming students and even those whom I worked with do the same. Besides, positivity is attractive, capable of drawing you to great people, places, things, and opportunities. Loving myself has allowed me to accept that while a romantic relationship is something I’ve desired for years, now is not the time. It has also taught me ways to treat other people that I care about better than I have in the past. I’ve refocused my energy into serving students in my leadership roles, investing more energy into my friends and family, and doing things that I love (i.e. creative writing, playing with toys, and watching shows like Riverdale and Baby Daddy). Now as I down this last Hershey’s and prepare to get my laundry done I’d like to share a quote by the fabulous RuPaul that I want you to take into the new year and beyond: “If you don’t love yourself, how in the hell you gonna love somebody else?” Whoever’s reading this, I hope you make a habit of loving yourself and living a life you’re proud of. If you find that you’re not, I hope you gather the courage to do so because the strength to make it happen is already inside of you.